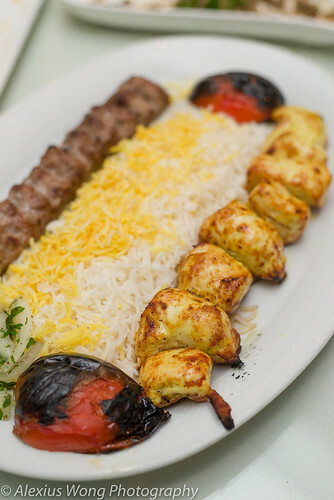 For the longest, I have been on the hunt for a decent Persian restaurant in the DMV. My love for this Middle Eastern cuisine began with its introduction during my college days 30 years ago when my brother’s girlfriend would invite us over to her mother’s home for wonderful dinners followed by a night replete with traditional music and dancing along some youthful camaraderie. The closest thing to that experience, cuisine-wise, in the DMV area was a small eatery that I discovered a few years ago when I started this blogging business, but the place folded up due to the lack of interest and not to its scrumptious offerings. So, recently, when an Iranian lady passed on a recommended eatery to me in a chance encounter, I was more than excited to meet this new place’s acquaintance. 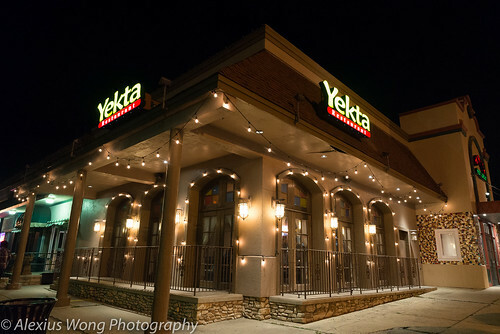 Yekta Kabobi is located in Rockville, MD, on the busy Rockville Pike that seems to harbor many eateries that I have visited, including Joe’s Noodle House (read blog) a couple of doors down from it. Walking up to the restaurant, I noticed an attached grocery store, both occupying the spacious corner lot of a strip mall. Upon entering, one notices the well-decorated walls and the stain-glass doors that add ambience and color to the space. After taking my seat at an inviting table in the corner of the room, I perused the menu which I found to be well-organized but fairly packed without overwhelming the diner. While trying to make up my mind, I started things off with a refreshing Pomegranate Juice. 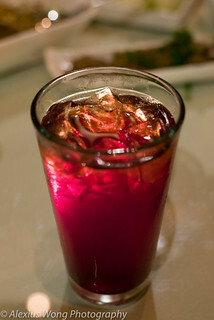 What arrived was a glass of ruby red juice that was a bit tart yet not cloyingly sweet like most juices in this country. Every drop was worth its antioxidant dosage that just set the mood right for the upcoming meal. 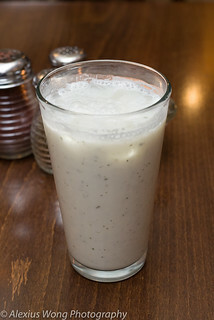 A glass of the traditional yogurt drink, Dough (doogh), was house-made (noted on the bill) with its light creaminess made interesting with a sprinkling of dried mint and a touch of salt, making it another refreshing drink worth ordering. Since it was a birthday dinner in honor of me, I was given reigns to place the order for the starters. 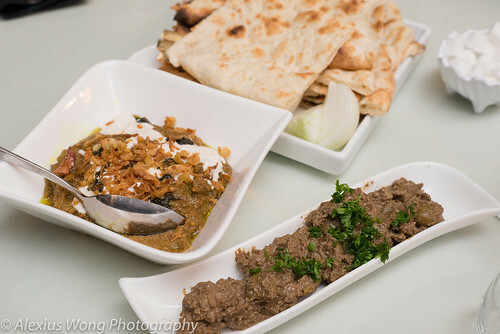 The first dishes were Kashka-o Badenjan and Zeytoon Parvarde. The first was a dip made from eggplant topped with fried onions, mint and fermented whey. The vegetable was not the usual smoky version but still silky enough with a topping of caramelized sweet onions, bright mint, and sour creamy whey. The whole mix was the perfect spread with the flatbreads that made the perfect vehicle for all its vegetal goodness especially with the good hit of fruity olive oil it exuded. The other appetizer was an unusual olive spread that peaked my curiosity. Not quite a tapenade since the olives were still whole, but it was covered with a thick paste made from crushed pomegranate seeds and juice, walnuts, garlic and herbs. For me, this was an eye-opener that kept beckoning me for more with its tart qualities married with the nutty texture from the walnut bits. My friends and I were quite enjoying both these openers, and we quickly got a bit stuffed by them. A dish that recalled the many nights of my collegial wonderment with this cuisine was Tahdig. It is the prized crust at the bottom of the pot of rice that is considered such a delicacy that a woman’s worth is judged by how she skillfully produces it, that is, in the Old World. 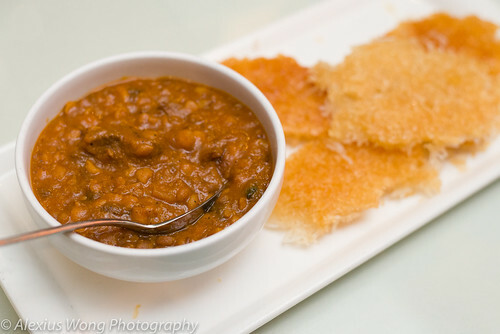 The rice rounds were served with a bowl of Khoresh or lamb bean sauce. The rice crisp were indeed crispy but not as flavorful as those I savored many moons ago since they appeared simply cooked with water unlike the stock-based ones. However, the lamb sauce was divine, made meaty-rich by the bits of lamb, full-bodied by the soft beans, and a bit citrusy by the tomato sauce and dried lime used to flavor the stew. Eventually, I focused on the stew and viewed the rounds as a canvas for this awesome sauce. On to the main courses. The Friday Night Special was Stewed Lamb Shank. What arrived was a large piece of meat with the bone attached to it. A taste of my friend’s dish revealed an extremely tender and moist meat, tasting mild from its gaminess, and mildly seasoned with salt or any other seasoning. But a taste of the jus revealed the use of saffron that exuded that exotic floral note to the dish, which made the meat more tempting. The side of Dill Rice reminded me of the one cooked 30 years ago that I always looked forward to at my friend’s abode. Despite such anticipation, one forkful proved to be a bit disappointing despite being light and fluffy: the rice was a bit bland due to the lack of bold stock in the cooking, and the rice was too moist from some moisture added before serving. However, the lamb was cooked just right enough for one to hone in during Friday and Sunday nights. 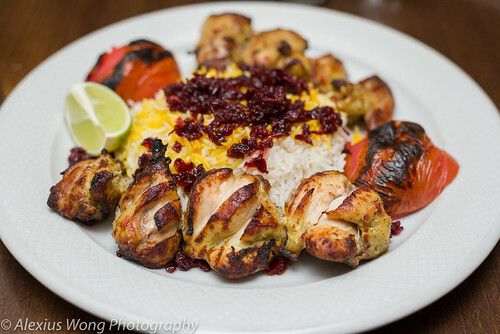 A couple of my dining companions got a combination kabob platters – Chicken Soltani Combination Kabob. The dish arrived with pieces of chicken breast flanking one side of some saffron Basmati rice and bits of ground beef kabob on the other. The poultry wowed me with the seared breast pieces that were moist (a tall task) and seasoned just right with a judicious hand. The beef was equally impressive, made from beefy Angus and seasoned with fresh herbs, onions and garlic, exuding the right flavors and moisture to make them sumptuous. Both meats were battling the diner’s attention and one couldn’t determine which was better. The charred pieces of tomato were sweet from the high heat but devoid of bitterness despite the burnt sections. Quality and price-wise, this is a definite winner in anyone’s books. 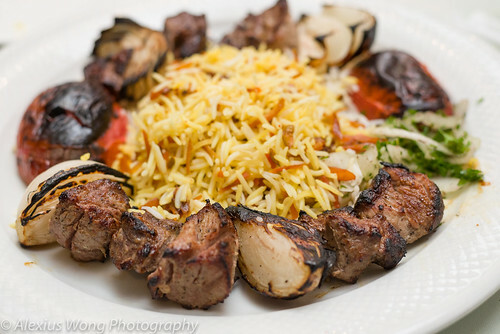 Being in a Persian restaurant, I knew I had to savor a lamb dish, thus my choice of Bagali Polo or Lamb Kabob. My dish arrived with a ring of grilled tenderloin, onion, and tomato, all hugging a mound of customized rice that I placed with the order. The lamb was properly seasoned, lightly salted and tasted quite mild of its lamb flavors. I didn’t mind that they were not as tender as one would as expect, but that is what one can expect for meat well-done, a common trait in Middle Eastern cooking. The pieces of onion and tomato were made sweet from the grill charring with the mild bitterness from the burnt bits that acted as a matching counterpoint to their sweetness. An equal star on the dish was the customized rice, made with a combination of orange peel, pistachio, and almond slivers, which one can pick from a list of possible rice combinations. The rice was supercharged with the candied orange peel, (tasting more like tangerine) that was perfumy and devoid of the bitter pith, and made nutty from the aromatic crunch pistachio and almond bits that also added some textural contrast. For me, this was the perfect rice combo that matched well with the savory lamb pieces, making it the quintessential lamb kabob dish for me, especially on my birthday. Another popular dish in the house is Joojeh or Grilled Cornish Hen. The pieces of poultry looked like pieces of breast meat upon the plate’s arrival. But one bite revealed their true nature. Each piece was a different part of the bird: the thighs, the breast, the back, and the wings, each carrying a slightly different texture due to their need for different cooking times and also the cut of bird. But what tied the disparate parts were the wonderfully perfect seasoning that was judicious with the salt and the various faint notes of je-ne-sais-qoui that brought some gestalt import to the whole mix, to which I ended up seriously gnawing every morsel of flesh from that small critter. The side of Barberry Rice, ordered as recommended by my waiter, was the perfect accompaniment with the pieces of fruit with its bright cranberry-like tanginess without having the usual sweetness associated with its American cousin. The rice and bird are definitely a match made in heaven, and it was definite treat for me to savor it, thanks to my waiter. 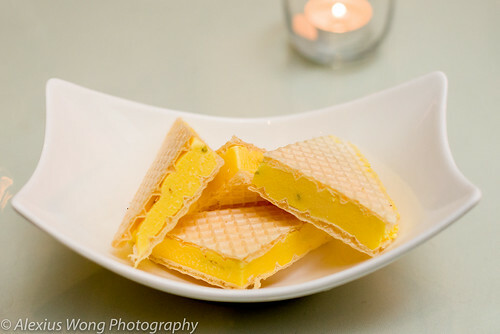 Reading online reviews, I was intrigued by a dessert that I had never heard of – Bastanee Nooni or Saffron Ice Cream Sandwich. My helpful server suggested us to have it prepared the traditional way: what arrived intrigued me visually with the ice cream sandwiched by some plain wafers, reminding me of growing up with this kind of ice cream sandwich. The icy filling was creamy and sweet enhanced by a rose-water note, exuding its mild exotic saffron floral notes that made each bite intriguing, and studded by pieces of fragrant pistachio. My dining companions partook in the divine dessert, but we regretted having just placed only one order to end our sumptuous meal. 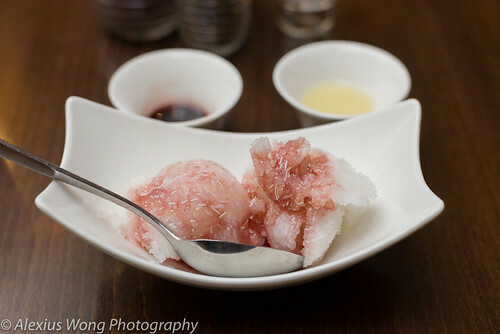 After replaying the flavors of the above dessert for a few days, I knew I had to taste another sweet treat on the second trip, and this time, I ordered Fadooleh or Rice Noodle Sorbet, which intrigued me upon reading its description on the menu. What arrived were two large scoops of sorbet that looked rather nondescript. After pouring the sour cherry sauce and lemon juice (bottled, unfortunately), I dug into it with my probing sensors full on. Different textures and flavors were registering on my tongue that made the dish both mind-probing yet delightful: firm rice noodles in the sorbet, almond-like notes from the sour cherry sauce, citrus notes from the lemon juice, and floral notes from the rose-water syrup pooled around the mounds. This was an exotic trip that continued my journey down this culinary tradition and another satisfactory ending to a delectable meal. 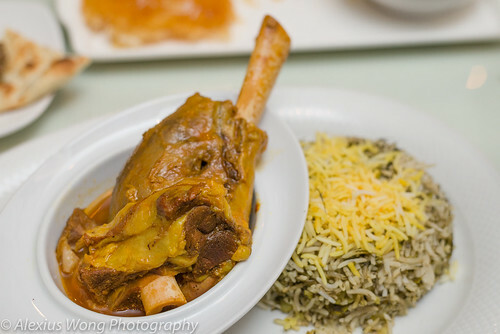 Yekta Kabobi Restaurant is truly a great find especially in an area where Persian cuisine is amiss, unfortunately so. What this place offers are delicious dishes produced by a skillful kitchen with their perfectly calibrated seasoning and authentic offerings, from the intriguing and savory eggplant and olive spreads, to the mildly yet tender lamb shank special, to the perfectly seasoned and equally cooked kabob beef, chicken and Cornish hen dishes, to the alluring and exotic rice combinations, and finally, the ice-cream and sorbet dishes that just whisk you away to a distant place with their irresistible yet unique flavors. No wonder I noticed the groups of Persian families, as well as those from other cultural backgrounds, enjoying their dinner here – diversity is an amazing thing. 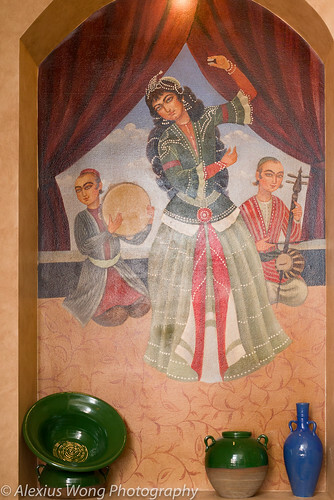 I know I have found a new favorite haunt not only to relive my youthful recollections but to also enjoy the flavors of Persian food that I discovered long time ago; this place is most worthy for this gastronomic task.